Keep your friends close and your tote bag closer. 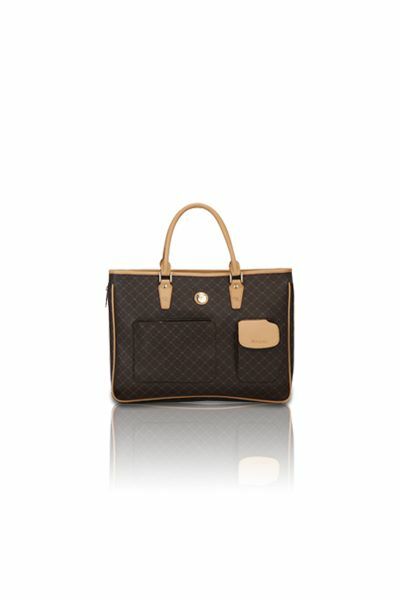 Gentle dark gold "RR" RIONI monogram print on solid brown designer canvas body accented with leather trim and gold hardware. Double straps, rear zippered pocket and dual exterior side pockets. Top zip closure opens to a center zippered divider pocket. Dark brown fabric RIONI monogram print lining. Interior contains a cell phone pouch, a pouch pocket, and a side zippered pocket. L15 x W6.5 x H11.5"
Product: Cassie Organizer was added to cart.